This is a gorgeously colored c. 1790 map that purports to show the colonies of the descendants of Ham. Ham appears in Genesis where he is of the sons of Noah. Following the flood Ham walks into Noah's tent and sees his sleeping father naked. When Noah awoke and heard of this misdeed he curses Ham and his descendants – who settled in Egypt and the near east. 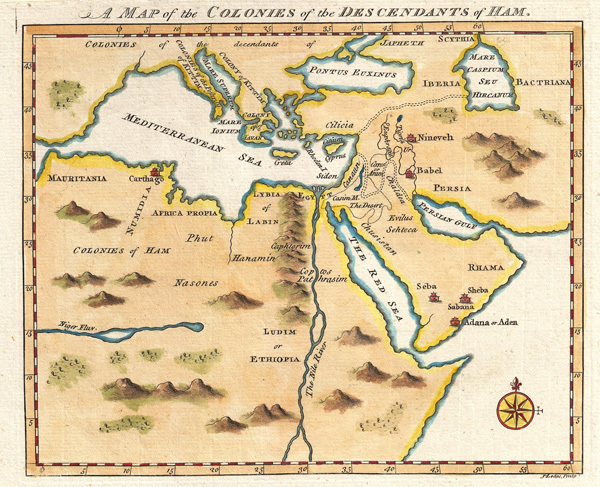 This map covers from from Mauritania in the west to Arabia and Persia in the east, Italy in the north and Ethiopia in the south. The cities of Nineveh, Babylon (Babel), Carthage, Seba, Sheba, Sana (Sabana), and Aden are noted. The author curiously places Sheba, the land from which the legendary Queen of Sheba who figured so prominently in Solomon's tale hailed, in modern day Yemen. Most contemporary scholars believe that the Sheba was in fact Ethiopian. Cartographically this map is reminiscent of maps drawn by the German polymath Athanasius Kircher, whose speculative underwater canals between the Caspian Sea and the Mediterranean and between the Persian Gulf and the Mediterranean are here rendered. This map was drawn by Lodge for an unknown English Biblical history in the late 18th or early 19th century.